The Walking Dead returns for its 6th season with premiere episode “First Time Again.” The episode starts off showing Rick Grimes and his crew leading a mission to deal with a massive herd of walkers. It flashes between their current predicament and various scenes that have taken place since the Season 5 finale, “Conquer.” Thus The Walking Dead gives us a sense of the aftermath of Rick killing Pete and of Morgan’s arrival in Alexandria. Those days or weeks leading to this attempt to shepherd hundreds of walkers out past Alexandria haven’t been easy. “First Time Again” gives us a chance to see where The Walking Dead characters we know have landed and to meet some other Alexandria residents. Rick goes over a plan to herd a huge group of walkers out of a rock quarry, well past Alexandria. This group of walkers started with a camp of a couple dozen, but their noise has attracted more walkers. It’s not clear how the new walkers made it inside the quarry, but now there are hundreds of the undead milling about the quarry. This, on top of Northern Virginia being mostly evacuated during the outbreak, helps to explain why the community of Alexandria has had to deal with relatively few walkers. 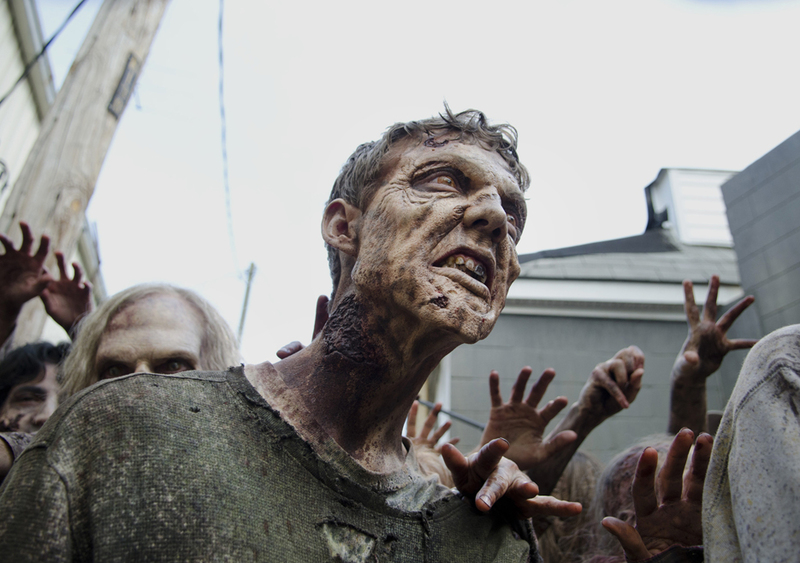 If these walkers get loose, their path will lead them directly to Alexandria. Rick tells the others, “I know this sounds insane, but this is an insane world. We have to come for them before they come for us. It’s that simple.” The walkers are penned in by a few semi trailers blocking the quarry exits. Rick’s concern that these poor barriers are already failing is confirmed when one of the trucks falls off the rock cliff. So much for a dry run, the group must take action immediately, carrying out a complicated plan to lead the massive herd away. Rick, Daryl, Glenn, Michonne, Sasha, Abraham, and Morgan are ready to spring into action, and the sheltered Alexandria residents who have volunteered to assist reluctantly join in. At the start of “First Time Again” we see Glenn return to Alexandria with Nick, bringing him to the infirmary, where Tara has just regained consciousness. Maggie arrives to check on Tara and Glenn. Eugene is practically, but not quite, speechless when he sees Tara has woken up. Tara says, “Thank God. Nothing happened to your hair … Okay, Eugene’s freaking me out. Someone want to send Noah in here to protect me?” Tara has yet to learn about what happened to Noah, and how Nick’s cowardice killed him. Though looks pass between Glenn and Nick and Maggie at the infirmary, Glenn doesn’t publicly out Nick at that time. 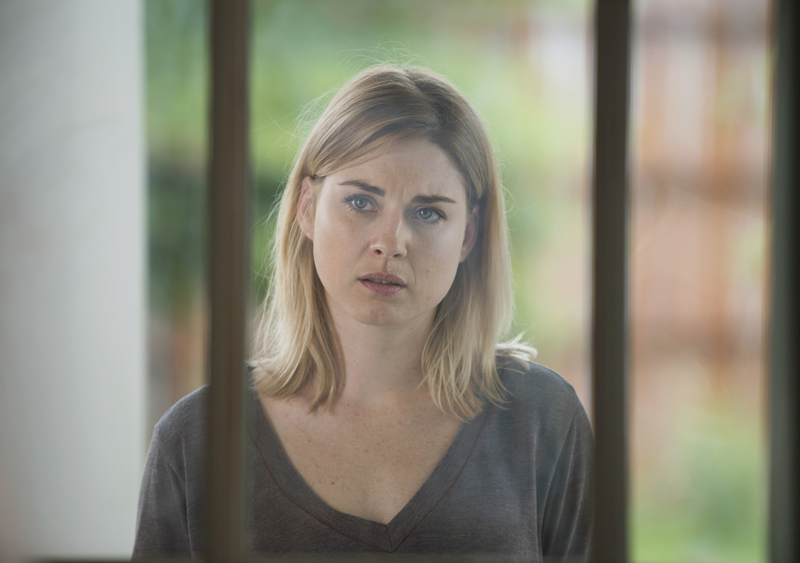 Instead, Maggie and Glenn are discussing whether or not to share what happened with the community at large, which could result in Nick’s exile. They decide to leave it up to Tara, since she was close with Noah. When Maggie and Tara discuss it, Maggie tells her, “I couldn’t accept it either, but then I thought about you—how we were on different sides of that fence on the worst day of my life. And now you’re one of the most important people in the world to me. Things can get better. We can make it better.” Tara agrees to follow Maggie’s lead. When Rick shares his plan to lead the herd of walkers past Alexandria, Nick quickly volunteers to help. Later, Glenn threateningly tells Nick that he doesn’t want him to come along. It’s clear that Glenn doesn’t trust Nick, and with good reason. The Anderson family is mourning the loss of their patriarch Pete. After Pete’s youngest son sought out protection for his mom in “Forget,” it became increasingly clear to Carol and Rick, in “Try” and “Spend,” that Pete was abusing his wife. After Rick’s public confrontation and Carol’s private one, Pete showed up drunk to Alexandria’s meeting, holding Michonne’s sword. Pete accidentally killed Deanna’s husband Reg, leading to her sanction of Rick’s immediate execution of Pete. Though they may have wanted their mother protected, the boys certainly didn’t want to see their father dead. Jessie tries to comfort her sons who have just lost their father, but her older son Ron storms off. Later, Carl is meeting up with Enid, who is playing with a lighter. They hold hands, not realizing that Ron, who thought Enid was his girlfriend, is watching from the woods. Ron’s not having a good night, and the following day things will only get worse for him. Since her brother’s death Sasha has been struggling. In “Them” she indicated through words and actions that she wasn’t sure she wanted to live anymore. Arriving in Alexandria didn’t seem to help Sasha, perhaps only making it worse for her seeing how close Tyreese was to getting somewhere better before he died. In the episodes “Try” and “Forget” we see that Sasha is having an acute stress response from the trauma. Whereas for Abraham, after the disappointment of learning that Eugene didn’t have the cure in the episode “Self-Help,” their arrival in Alexandria seems to have given him renewed purpose. Abraham helps clean up after the double-homicide meeting. As she is doing her rounds, Sasha finds him drowning his sorrows in alcohol. He doesn’t seem pleased to see her and she moves on. There seems to be a lot of tension between them, which is strange since we’ve rarely seen these two interact. Despite their tension, when Sasha volunteers to help drive a car leading the walkers down the designated path, Abraham offers to join her. Later, when they are out preparing for the plan, Abraham asks Sasha if she volunteered because she wants to die, and she tells him no. Eugene watches the gate and is surprisingly calm when a car drives up. A man named Heath demands to be let in. telling Eugene that group has been on the run the last few weeks. Eugene is reluctant to open the gates, but finally lets them in. Scott and Addie get out of the car and introduce themselves to Eugene. When Addie asks Eugene how many are in his group, he responds, “Thirteen, I mean twelve,” reminding us again of the very recent loss of Noah. At least the return of this Alexandrian group means that Eugene has someone who he can relate to, hair-wise. Rick last saw Morgan in the season 3 episode “Clear” when he found Morgan holed up in their hometown. Morgan was losing his mind after the death of his son. Rick tried to help him, just as Morgan had helped Rick when he first woke up from a coma and found himself in a zombie apocalypse. Viewers knew that Morgan had been looking for Rick since then, because in “Coda” Morgan found the note Abraham left for Rick on a map, back at Father Gabriel’s church. Rick, Daryl, and Morgan sit in a kitchen. Morgan shows Rick the map left by Abraham that he has been using to track him down. Morgan appears to have satisfied Rick’s questions. They walk around the community and Rick tells Morgan about Alexandria and its people: “A lot of people in here, they’ve been in here since the start. They had food, energy, not a whole lot of walkers. They just lived. They haven’t had to survive. They figured that out and brought us in.” Rick isn’t sure if it’s already too late for the people of Alexandria to come around. Rick finds Father Gabriel and Toby burying Pete, and tells them they don’t bury killers within Alexandria. Toby tells him it’s not his decision, but Deanna shows up and agrees with Rick. She tells Rick to take the body out west past the bridge, where they normally don’t go. Pete’s son Ron is surreptitiously watching all of this. As they load up the body, Rick explains to Morgan why he shot Pete, saying he had no choice. When Morgan points out that they have a cell to hold people, Rick says it’s not for killers. Morgan responds: “I’m a killer, Rick. I am, and you are too.” As they drive past the bridge, Ron follows. As Morgan starts to dig, Rick hears the sound of walkers. This is when they discover the quarry pit full of walkers. This is also when they discover that Ron has been following them. Rick stops Ron from running over the cliff and he and Morgan kill the walkers chasing Ron down. Ron has followed them out so he would know where his dad is buried. Rick tries to give Ron a paternal but threatening talk: “If you come out here, you’re going to die,” but Ron has nothing but contempt and hatred for the man who killed his father. Despite his concern about the herd, Rick’s humanity has been sparked enough to stop and dig Pete’s grave before they head back to Alexandria. Rick leads a meeting to discuss the walkers in the quarry. He points out that it will only take one more hard rain to send the walkers towards Alexandria. Carol plays her role, echoing the unspoken concerns of the inexperienced people of Alexandria, while dismissing them: “This is so… I don’t even have another word for it, this is terrifying. All of it. But it doesn’t sound like there’s any other way.” Despite this, Alexandrian Carter suggests enhancing the wall instead or leading the walkers away. 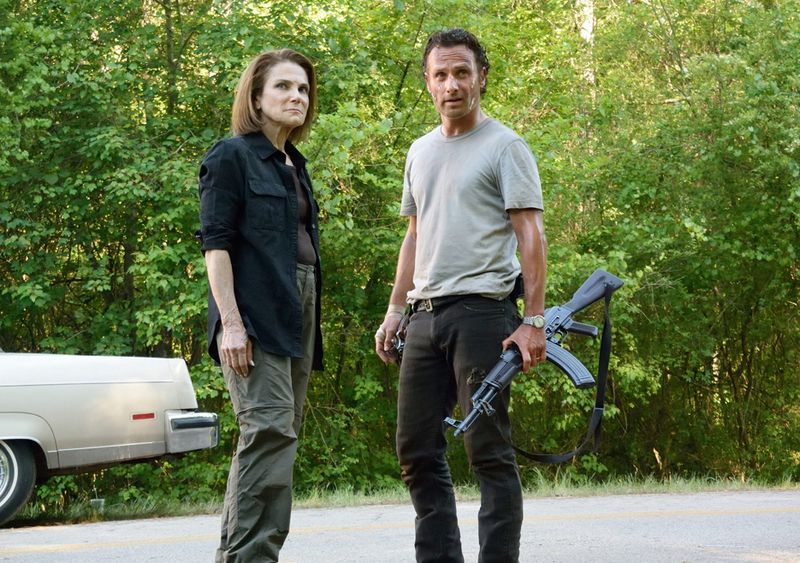 Deanna tells the group they will go with Rick’s plan. Daryl will lead the walkers away, with support from Sasha and Abraham. When Rick asks for volunteers, Glenn quietly tells Maggie she should stay close to Deanna instead of helping with the plan. Michonne and Glenn offer to join in. Father Gabriel offers to join, but Rick doesn’t want his help. Thank goodness, that dude is bad news. Carter questions why they should follow Rick after his threatening behavior. Heath, Francine, and Tobin also volunteer. Nick looks at Glenn, who glares and shakes his head no, but he nervously volunteers anyway, saying he needs to help. Since arriving in Alexandria, Carol has been acting helpless, hiding her true badass nature. Though Carol may have been a passive person who needed to be protected by others, she has long since transformed into someone you don’t want to mess around with. If it hadn’t been clear before, it certainly was crystallized when she threatened young Sam Anderson in “Forget.” She uses her non-threatening pretense to gather information within Alexandria. But Morgan sees right through her act. Morgan asks Carol if she was a cop like Rick. After the meeting, Rick, Michonne, Heath, Deanna, Eugene, Morgan, and Carter talk about the plan. As they discuss it, Carter shows more resistance, pointing out where a curve in the wall could send the walkers into Alexandria. Rick’s response is that they will need his help to fortify the wall to make sure that doesn’t happen. Morgan adds, “These walls, you built them. So you’ve already done the impossible.” Morgan prefers the positive reinforcement approach to Rick’s threatening ways. Carter takes responsibility for the plotting and for a tense moment it’s not clear if Rick will kill him. Daryl says, “Rick?” but Rick says he’s fine. 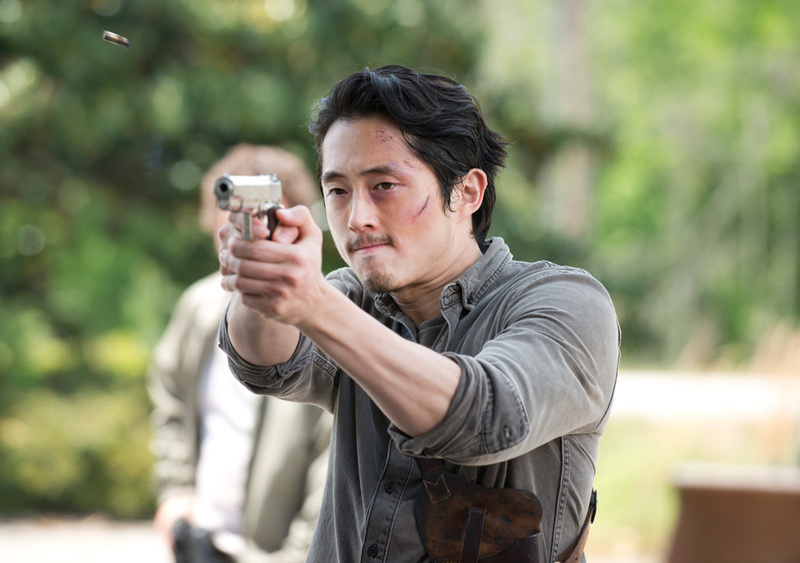 He gives the gun to Daryl, then tells Carter he can try to work with them, to survive. Since arriving in Alexandria Morgan has been ever watchful as Rick makes his decisions when dealing with both people and walkers. Later, Morgan sits on the porch where Rick, Carl, Baby Judith, and Michonne live. Rick suggests that Morgan should stay with them. Rick tells him, “I know you, Morgan, even if this is the first time.” Michonne and Rick watch Morgan hold Baby Judith. Rick runs into Jessie. Awkward. He tells her he’s been giving her space, that they shouldn’t be seen together right now. Jessie doesn’t seem excited to see Rick. She explains to him that he can’t be the one to tell Ron what to do, let alone try to teach him how to shoot. Rosita is teaching her how to use a gun and she will teach her sons. For a father, Rick seems strangely obtuse about why he can’t be involved with the sons of the man he killed in cold blood. With the timeline to herd the walkers away being unexpectedly moved up, Glenn, Nick and Heath have been dispatched to deal with walkers trapped in a heavy equipment store. If they don’t, the noise the walkers are making will drive the herd off the road. Glenn was reluctant to take Nick, but with the dress rehearsal going awry, he brought Nick along. Heath is unsure of Glenn’s plan, but Nick tells him, “You’ve been on the run since he got here, he knows what he’s doing. Meaning we didn’t.” Glenn’s plan is foiled when they realize the front door has metal security door behind it. The revised plan has Heath and Glenn killing walkers, while Nick stays back to lead the walkers away if things go bad. The three together manage to kill all the walkers. It appears that Glenn and Nick have come to some kind of unspoken resolution. Rick leads a group into the woods. They can see the herd walking down the road, just as planned. Carter tells him, “It’s working. You were right,” and shakes Rick’s hand. They fan out along the road to ensure the herd stays on route. Carter heads towards the front, but is attacked by a walker in the woods who bites him right in the face. That’s gotta hurt. Rick kills the walker, then silences Carter’s screaming with a knife to the back of the neck. Morgan and Michonne have watched what just happened. Morgan has something to say to Rick, but he doesn’t want to hear it. Rick’s focused on the plan. Just as it appears that the plan may work, there is the sound of a blaring horn. 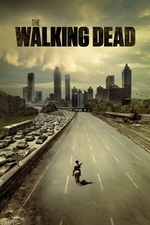 The walkers begin to leave the road and head towards Alexandria. Rick realizes the sound of the horn is coming from “home.” Rick’s well thought-out plan has quickly gone awry. 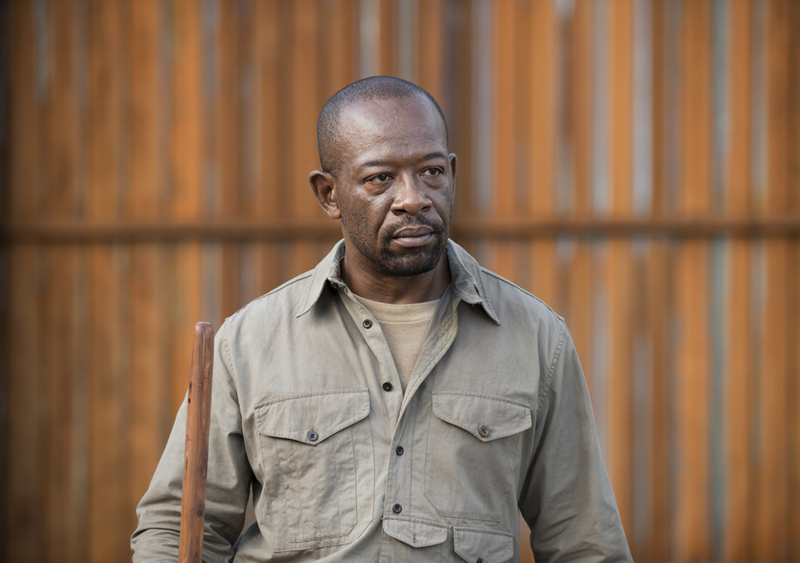 Morgan (Lennie James) adds a new dimension to the show, and he has great chemistry with Rick (Andrew Lincoln). The presence of Morgan in Alexandria brings a new complexity with someone who is just as strong as Rick, but approaches things differently. 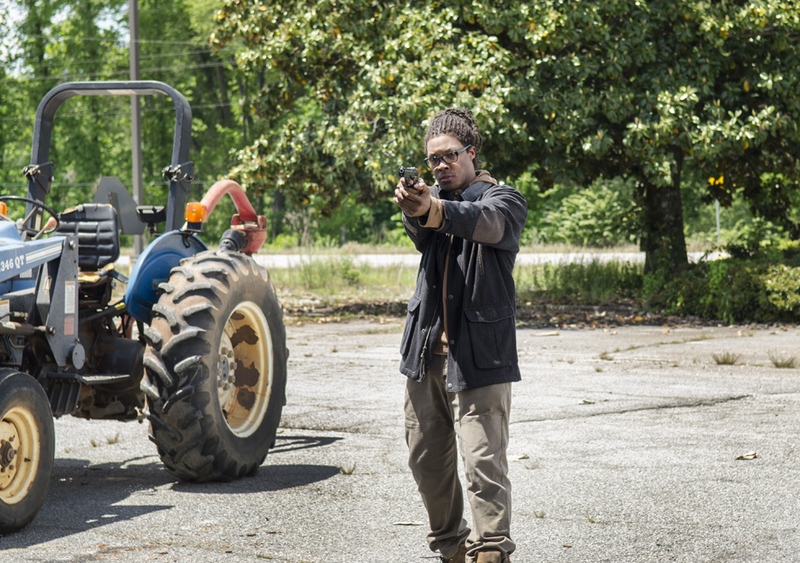 The Walking Dead introduced the new characters Carter (Ethan Embry) and Heath (Corey Hawkins) very well. We can’t say we’re sorry to see Carter go, but Heath already feels like someone we’ve known a long time. ← Coming Soon—Birthday Caption Contest!